Truth be told I started my blog almost 2 years back when the place I was working closed down. I had always wanted to start one however this gave me the extra push to do something as a hobby. Since then I feel like I myself have come a long way in the sense that I didn't exactly know what job path I wanted to go down but I'm finally going down the one I know I want. Along with myself I feel like my blog has come a long way too. It may not be as good as I'd like it to be but it's definitely a step up from my old dreadful layouts and dreadful quality photos. Nobody in my family knows about my blog as it's just not something I feel the need to bring up in a conversation however I have no shame bringing it up at a Job Interview because not only is it something to be proud of but you actually learn skills that you may not notice! We all have a schedule for our blogs right!? Personally mine is posting every second day and if I do say so myself I do quite well at sticking to it. Keeping to a schedule means you're able to keep time well and can meet any deadlines that may be thrown at you. Yes every now and then we may miss out on a blog post because we're feeling under the weather but 9/10 times you're on the ball! Being able to keep to a schedule can show that you're able to work on a deadline and that you're a good time keeper in the sense that you won't miss it! It's no doubt that we put a lot of pressure on ourselves. Between taking photos, editing and writing I'm sure we get annoyed at ourselves a few times, myself probably more than I should. Maybe you've worked with a brand who only gave you a short time limit to get your blog post done and posted. All this can show that you can work under pressure whatever it may be, yes you may get stressed out a little but you still manage to get it done! Taking this into the workplace means you can work towards your daily/weekly targets for sales or whatever it may be. Depending on the career path you're on depends on whether or not you'll actually use this however it's something that blogging has allowed you to learn and it's another skill to have. Personally I love the HTML part of blogging, I may not be the best or know very much but I do know the basics that I can fix things here and there when I need too. Remember when you first started blogging and coding looked like a foreign language and now think of how much you know, impressed? Now imagine someone who doesn't know much about it, would they be impressed? Well at least I hope they would! Being a blogger you communicate with brands and PR companies on a daily basis. You've come to learn how to talk to people over email in a professional manner but still keep your personality so that you don't sound like a robot! When you first started blogging I'm sure there was a few odd x's sent by mistake along with the odd emoticon face but these days you know how you like to come across and you're able to communicate in a way that is professional but still you! Who knows promotion better than a Blogger. We're constantly promoting our latest posts on Twitter, Instagram, Facebook, Pinterest and more! We're practically pros at scheduling tweets even though it's the most dreaded thing we have to do. We also communicate with people everyday and so seeing a notification pop up from your Facebook, Twitter or other social media accounts is no surprise. Basically we're really good at communicating online. Depending on the kind of blogger you are depends on what the topic is you know most about. I'd class myself more of a Beauty fanatic than a Fashion one therefore I usually know about the newest releases and have a pretty good idea from my own experience and reading other blogger reviews on beauty products. If someone asks me to recommend a waterproof mascara that isn't clumpy but will still give them volume, I could probably recommend at least 6 different ones. If someone told me they had dry skin and were looking for a foundation to suit their skin type again I'd definitely be able to recommend a numerous amount of different budget ones. This applies to everyone depending on their niche. These are just a few points I thought would hopefully convince you to put your blog on your C.V. It may be a scary thought going into an interview with a person you don't know with the chance that they know about your blog and have been on it. However it'll more than likely be brought up and because it's yours and you enjoy doing it, it's so easy to talk about and it shows the employer how passionate you are about it. It also allows the employer to see a bit of your personality before they have even met you which I think is nice. But these are just my thoughts and yours may be different than mine! Have you got your Blog on your C.V? This is something I'm still debating to be honest! For some jobs definitely, I think it really adds to your application, but for others it could hinder your application just as much I think. I write a lifestyle blog which can be great for interviewers getting an honest and I would like to think a positive impression of me. They like the influence we bloggers can have, but at the same time they might be put off by someone who writes a lot about their life, especially when that person could potentially have a lot of negative influence on the company if something goes wrong with the job. Does that make sense? I try not to write about work or school, never mention names etc, and I wouldn't blast any old jobs online, but I feel some interviews/ bosses can be put off by the fact that we have the potential too. Then again, my blog has come really far, I'm extremely proud of it, and I think you're right about the skills it shows we have, it shows commitment, and the effort we'll put in. I think people are beginning to realise that blogging is a lot more than just writing, it's editing, photographing, managing social media, connecting, etc. I've also made a lot of brilliant friends and connections from blogging, so I think it could be really valuable addition to a CV. I think it depends on the job through, I'm not sure. I totally agree with blogging giving you so many transferable skills! My aim after university is to go into teaching, and I think in that case they aren't always keen on extensive social media! I think post-grad I won't add it to my CV unless my blog becomes more anonymous, however, for almost any other job I think it's perfect! 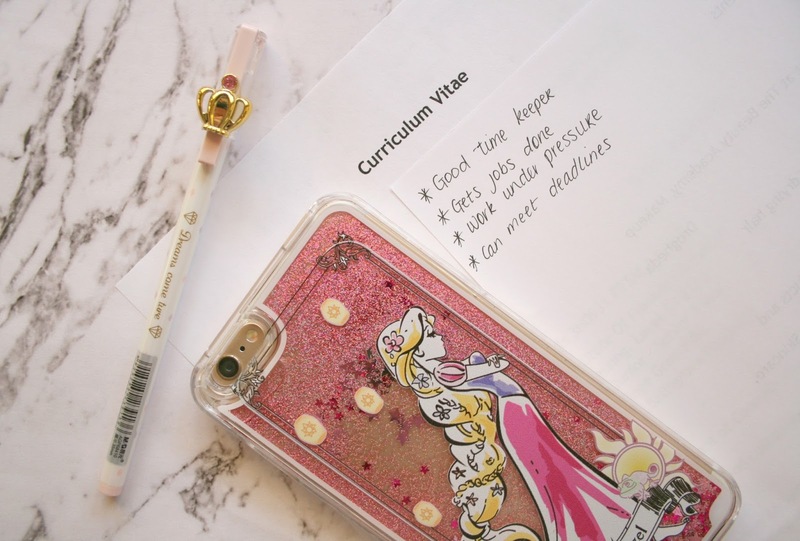 Blogging gives you so many transferable skills and is definitely worth putting on a CV. I find it no less of a hobby than photography and people have degrees in that. It's a really great learning curve. I'm 6 months into blogging and coding/HTML is still a foreign language to me, I really need to look into it some more! I put blogging on my CV and mention it in interviews, where relevant. I've never had a bad response to it! In my current job, it meant that I now manage our blog at work and do a lot of social media work. I don't have my blog on ym CV, but that isn't because I'm hiding it - I'm a teacher and have never really seen how it could apply, but I guess your right; there are a huge range of skills required!